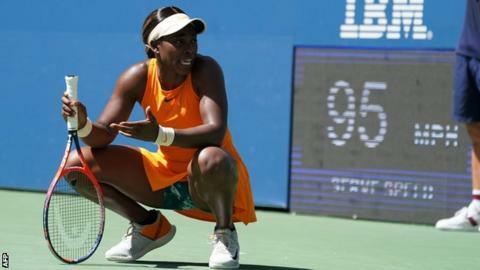 Defending champion Sloane Stephens has been knocked out of the US Open in the quarter-finals after defeat by Latvia's 19th seed Anastasija Sevastova. Sevastova will face Serena Williams in the first Grand Slam semi-final of her career on Thursday. The high temperatures have been a significant issue during this year's championships with the conditions described as "dangerous" in the opening rounds. "I think it was very physical today and tough to play," Sevastova said. "It was so hot in the stadium. I just kept fighting." Stephens struggled with her movement, was repeatedly being caught out by Sevastova's drop shot and after a number of wayward errors was bent double on the court. The 28-year-old was appearing in her third Grand Slam quarter-final - the previous two also coming at the US Open in 2016 and 2017 - and admitted she was not expecting to hit such heights on her return to the sport. "I did not have many goals," said the Latvian. "Maybe the top 100. "But now, obviously when you win more you have higher goals. And when you're winning a tournament, you think that's normal." "The fact that I made it to the quarter-finals, played some really good matches and I competed as hard as I could, means I have a lot to be proud of. "Defending a title is very hard, very difficult. If you were defending, you'd be playing the same exact people all over again, which I didn't. "I'm not going to dwell on it. Just keep building. There's four more tournaments left. I'm just going to try to play the rest of the season as hard as I can and hopefully have some more good results."